For over twenty-five years Alec Taylor has laboured to produce the Pilgrim Bible Notes that have benefited and blessed the people of God. From the labours of those years, Alec has carefully selected the readings in this volume to give a 'through the year' daily study and devotional. Like its predecessor, A Pilgrim's Treasury (also from EP Books), this volume will richly reward the regular reader with treasure from the living Word. This new volume has readings from: Ezekiel, 1 & 2 Peter, Daniel, the Gospel of John, Ezra, Haggai, Nehemiah, 1, 2 and 3 John, Ecclesiastes, Psalms 1-12 and Revelation. Christians are facing greater pressure in the western world than for over 300 years There are perils coming from outside the church: persecution, militant atheism and mockery of our precious faith. There are also perils from within: false teaching, worldliness, and discouragement. All these circumstances arise in the biblical books that this volume covers. The readings have been selected to encourage Christians living in difficult times and at the same time provide evangelistic encouragement. The carefully selected daily Bible readings cover 366 days.As the readings are used, you will encounter biblical characters who, like Christians today, faced hostility and persecution and yet by the grace of God triumphed in them. 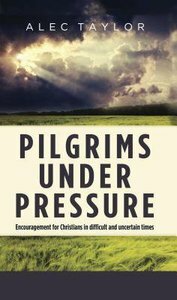 About "Pilgrims Under Pressure: Encouragement For Christians in Difficult and Uncertain Times"
Alec Taylor was for many years the minister of Chelmsley Wood Baptist Church, Solihull. He is now retired and lives in Wiltshire with his wife. He continues to have an active ministry in the UK and overseas.